You could go out and buy right now a BMW X5 M or Mercedes-AMG GLE63 for well over six-figures each. Or, you could wait a week or so for the official debut of the Hellcat-power Jeep Grand Cherokee Trackhawk at the 2017 New York Auto Show. According to Autoblog, Jeep head honcho Mike Manley confirmed the reveal at an event last week previewing the Easter Jeep Safari concepts for Moab. "That is going to be quite a special vehicle," Manley stated. "Very difficult for one not to smile." We already know, more or less, what the finished beast of an SUV will look like, but it’s what’s under the hood that’s making us all giddy: the supercharged 6.2-liter Hellcat V8 with 707 hp and 650 lb-ft of torque. Currently, the fastest and most powerful Grand Cherokee you can buy is the SRT, with a total of 475 hp and 470 lb-ft of twist. 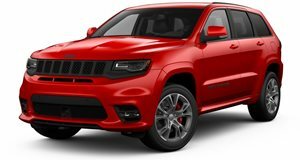 Jeep claims it can do 0-60 mph in a respectable 4.9 seconds, but the Grand Cherokee Trackhawk is expected to do the same sprint in around 3 seconds. Exterior changes will almost certainly include hood vents, larger air intakes up front, new wheel designs, and plenty of Hellcat badges. Pricing may also be announced next week, and we predict it’ll be less than six-figures, at least its base price. We just find it pretty hard to imagine a Jeep costing more than $100k, regardless of what’s under the hood. In any case, this year’s New York Auto Show will be quite something for Jeep’s parent company, FCA. Remember, the Dodge Challenger SRT Demon will also make its debut appearance in the Big Apple.